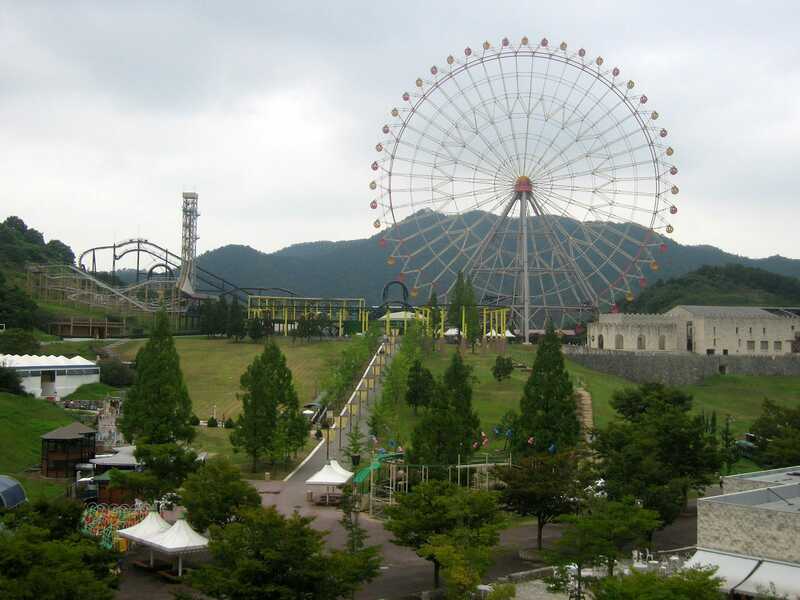 Himeji Central Park is a four coaster park located roughly eighty kilometres to the west of Osaka. Though a pleasant enough facility, the reader should be aware that visits are horrendously expensive even by local standards. We bought a ticket at the bus station which included admission and round trip transportation for ¥3350, which seemed fair enough. Unfortunately however it turned out that this price was only for a garden ticket; the use of any attractions would require additional payment. Wristbands were available, but ¥3200 represented a near-doubling of what we'd expected our visit to cost, and neither of us felt like spending that much money. 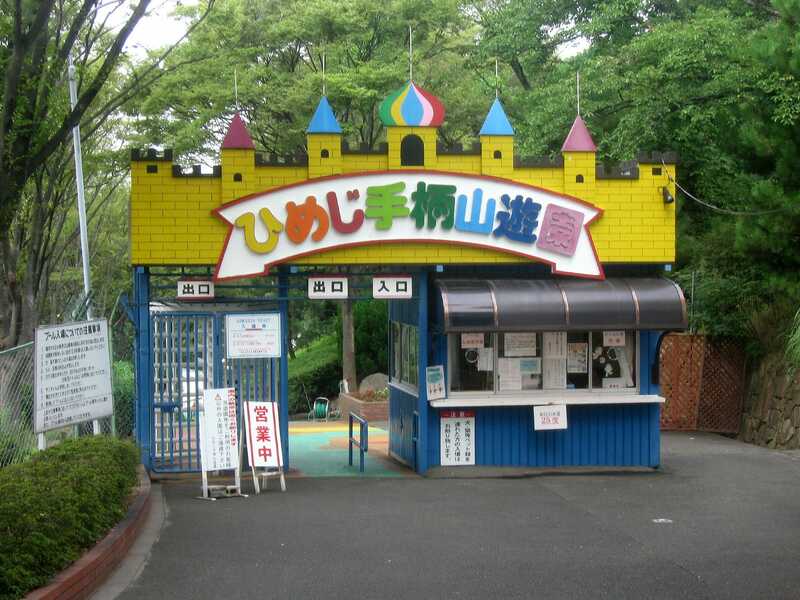 Instead, we reviewed the ride list and decided that we'd limit ourselves to one ride on each of the four coasters, which came to a total of ¥2000 each. It would have been nice to ride the first-generation Intamin Giant Drop, but we decided that ¥700 apiece was too much money. The minuscule number of people in the park today clearly demonstrated the insanity of this pricing policy; staff outnumbered guests by at least three to one, making it highly probable that the place was losing money during our visit. We found ourselves wondering how they could afford to open at all, as the coasters alone would have been valued in excess of twenty million euro. Our first stop was at Camelback Jetcoaster (#572), a substantial L-shaped ride with somewhere in the region of a kilometre of track, roughly half of which was installed outside park boundaries. The layout was for the most part forgettable, as there were no drops beyond the gentle sloping hills akin to those experienced on the Rhythmical Coaster earlier in the week at Harmonyland. The main thing to be said for the experience was that it was more interesting than Imorinth (#573), a Pinfari-built Big Apple with a bright pink train. The other two coasters were located at the top of a rather steep hill. 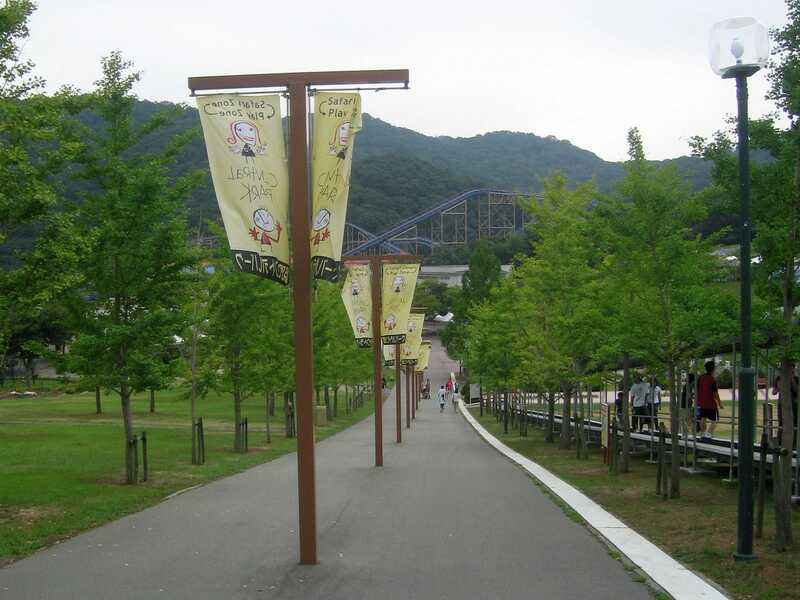 Park management clearly foresaw the issues this might present during hot and humid weather, and installed a moving walkway along the side to make life easier for their guests. We were just about to step onto this when we spotted signage indicating that it was an upcharge attraction, requiring an additional payment of ¥50 at the apex. A member of staff was indeed waiting there underneath a shaded umbrella. We decided to walk, and used the climb to mutter unpleasant observations about businesses that choose to nickel-and-dime their customers. Labyrinth (#574) was the first coaster of the day which it would have been nice to repeat. The layout was very similar to that of a western-built mouse, with all but the final turn being of narrow radius. The left hand side of the layout featured some very stretched supports, suggesting rather strongly that the design was originally supposed to be installed on a flat area of land rather than on the side of a hill. The operator had no problem with me taking pictures on board, although my camera decided it did; only two of my rapid fire photographs were in focus. The only remaining ride for us was Diavlo (#575), a rather good B&M inverted coaster with a layout better known as Batman the Ride in the Six Flags parks. The close proximity of trees to the first drop made that portion of the ride more interesting than in the other seven models I have been on, but some very odd vibration slowed down the train and weakened the forces that layout normally delivers. We were the only two people in the train, perhaps unsurprising given the ¥700 ticket price. 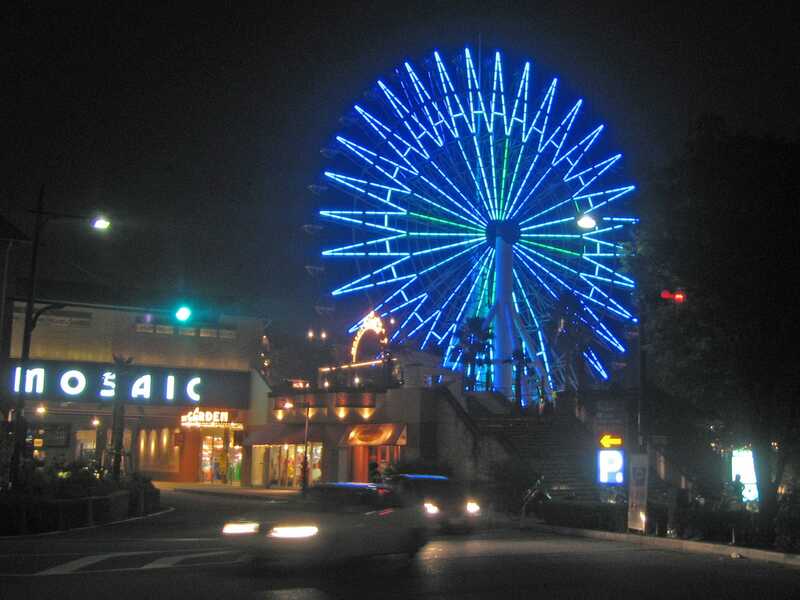 We had been advised ahead of time that the best way to get to Himeji Tegarayama Amusement Park was to take a taxi from the local train station. The driver understood the first part of our request and brought us to Tegarayama hill. Fortunately, I had a picture of a roller coaster in my bag which I could point at. Light dawned, and we were brought half way up the hill to where the park was located. In sharp contrast to the previous park, admission here was free as we did not want to use the water park. All we would need would be ride tickets for the coasters and anything else we wanted to try. Wasting no time, we boarded Slope Car (#576), an extremely unusual coaster that could be considered as an ancestor of more recent bobsled designs. The cars were free to roll through a trough, gently bumping off each side as we rounded corners. The whole layout followed a zig zag course from the top of the lift down to the station. There were braking areas in places presumably to stop the cars getting too fast; without them there would be a definite risk of cars going over the edge of the track, which would if nothing else reduce the number of repeat riders. There were several gardeners tending the flowers beneath the trough as we passed, and they all waved to us in sequence. The pattern was precise enough that they could easily have been mistaken for remarkably life-like animatronics. After a quick spin on Mad Mouse (#577) we made our way over to Jet Coaster (#578), an interesting looking ride that made a wide circuit of the water park. The first half of the course included some good hills, although the second half was simply a slightly inclined descent back to the station; presumably the coaster would not have had enough energy to get back otherwise. In an ideal world I'd have liked a slightly higher lift hill in place of the dead spot at the end, but the additional steel may well have been beyond what the park was willing to pay. We had a minor problem getting back to the train station from the park, as we realised belatedly that the entrance is not the sort of place that taxi drivers congregate. We ended up walking into a museum nearby where one of the staff was able to phone for a vehicle, which arrived in an impressive ninety seconds from the call. We concluded that he must have been half way up the hill already, but whatever the case the efficiency was much appreciated by us both, as we had two more parks to get to before the end of our day. 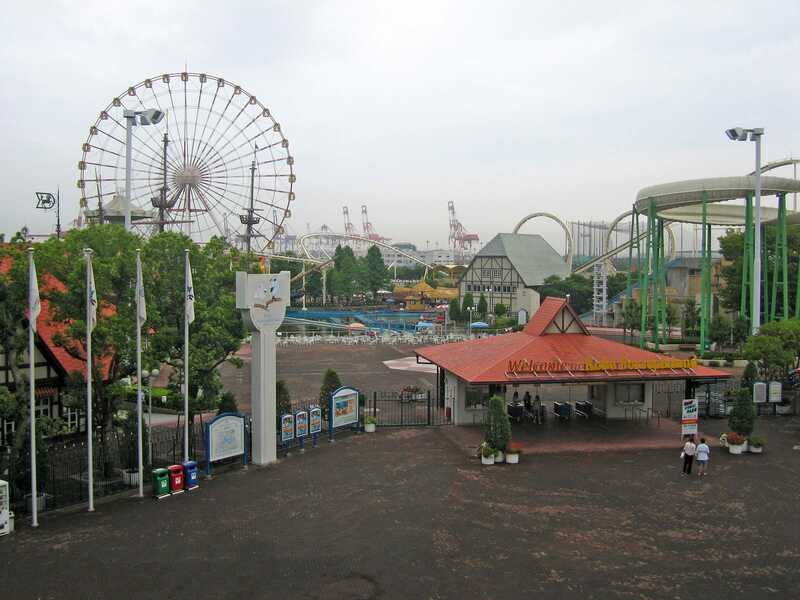 Kobe Portopialand is one of a small number of parks that I have wanted to visit since I first heard about it. Initially there were only three reasons, namely two classic Schwarzkopf coasters and a Mack Bobsled. By the time of this trip, however, a fourth had hit the radar; the park was to close permanently at the end of the year as the land had been sold to IKEA. As such, it was now or never. That was why we disregarded fatigue in favour of taking the Kobe Port Liner railway to Minami Koen station, located directly in front of the park. Our first stop was with the bobsled, named Munich Autobahn (#579). I'd really been looking forward to riding this, which might possibly explain why the whole thing seemed a bit underwhelming; it wasn't a bad ride by any means, but it was definitely the weakest of the six operating models in the world (and yes, I've now ridden them all!). Perhaps I'd have enjoyed it more were it not for the fact that my car was shuddering continuously; it felt almost as if there was a loose bearing somewhere. A quick detour into the Sea Side Thriller House dark ride brought us to the smaller of the two remaining coasters. Though it is heresy to use the word pointless to describe a Schwarzkopf ride, Double Loop (#580) honestly wasn't one of Herr Achterbahn's finer efforts. The layout featured a good first drop, two half decent loops, and then a whole series of slow turns that were too slow to be thrilling. We decided against riding a second time even in the clear knowledge that the ride will almost certainly be going to the scrapheap in a few weeks. Fortunately the other coaster was in a totally different league. BMRX (#581) was built around an artificial mountain structure, and featured a positively superb mid course drop that was easily the best of any coaster I've ridden in my career, especially when ridden from the back of the train. Though the layout would have stood fine on its own, special effects with lighting and dry ice were utilised in the latter half of the course, enhancing what was already a upper echelon coaster. We rode four times, and might have ridden more had we not been hungry. (This ride was thankfully rescued after the demise of Portopialand, and reopened in late 2007 in England, albeit without its theming). Before eating I decided we should have another try at Munich Autobahn to see if our previous impressions had just caught it on a bad run. This time we were sitting towards the back of the train where the vibration was much less noticeable, though still present. While a definite improvement on earlier, I have to stick with my assessment that it was the weakest of all the bobsled coasters and therefore not something that will constitute a massive loss. Food proved to be an unusual experience. One was expected to decide on a selection from a pictorial menu, as seen just about everywhere in this country. Rather than order from a waitress, however, it was necessary to make this selection on a vending machine, which would then print out a ticket which you handed in at the counter. In due course, your number would be called and you could collect your food. Our lack of Japanese made this a potential challenge, but fortunately the staff took pity on us and delivered our choices to our table. It is times like this that I feel sorry there is no such thing as tipping in this country, as such good service deserves recognition. I had previously asked Martin if it was worth making the effort to visit Mosaic Garden, and he responded in a typically candid fashion; "only if you're a real credit whore". We decided that we should call in as we were credit whores and as it was more or less on the way back to our hotel. We were somewhat bemused to discover that Super Express (#582) was a clone of Labyrinth, and though this machine wasn't running quite as well as its brother it nevertheless constituted another tick on the road to my number six hundred, expected in a few days time.